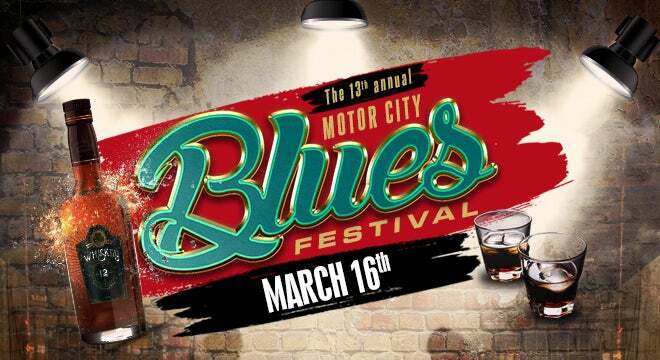 The 13th Annual Motor City Blues Festival featuring Sir Charles Jones, Pokey Bear, Shirley Brown, Theodis Ealey, Calvin Richardson and Lenny Williams will perform at the Fox Theatre on Saturday, March 16 at 8 p.m.
Sir Charles Jones is an artist who has mastered the collaboration of throwback and modern in his traditional Southern style of R&B. He is a vocalist, songwriter, producer, multi-instrumentalist and self-proclaimed “Undisputed King of Southern Soul.” His sophomore album, Love Machine (2001), reached #9 on the Billboard Independent Albums chart. Three years later, Jones released his third album, A Southern Soul Party, which peaked at #11 on the US Blues chart. His fifth album, My Story (2008), reached #13 on the US Blues chart. Southern bluesman Pokey Bear injects a larger-than-life swagger into his R&B-infused bayou soul. One-third of the Louisiana Blue Brothas with Tyree Neal and Adrian Bagher (the trio issued Love on the Bayou in 2014), Pokey Bear also released the solo effort Josephine Son Pokey in 2014. The album included sensual dance tracks like “The Gingerbread Man” and “Mr. Hit It and Quit It” as well as his de facto theme song, “They Call Me Pokey.” Mr. It Ain't Fair arrived in January 2016. The album featured local dancefloor hit “Good Foot” and “Shake That Money Maker” with Mystikal. Shirley Brown was born in West Memphis, but was raised in Madison, Illinois, where she started singing in church at the age of nine. Her 1974 hit,“Woman to Woman,” spent two weeks at #1 on the Billboard R&B chart and climbed to #22 on the Billboard Hot 100. It sold over one million copies by December 1974 and was certified Gold. She signed to Arista Records in 1977 and her self-titled sophomore album included the hit single, “Blessed Is The Woman,” which reached #14 on the R&B chart. Theodis Ealey is hailed as a blues singer, guitarist, and bandleader. Blues fans know him by his nickname “The Bluesman Lover,” for his brassy R&B love tunes. In 1994, Ealey won the Male Vocalist Top Star Award in San Francisco, and three years later he was named the Mo' Better Blues Male Artist of the Year in Atlanta. In 2004, Ealey released the album Stand Up in It, and the title track, a playfully raunchy bit of bedroom advice, became a surprise hit single, spending 21 weeks on the R&B/Hip-Hop chart and peaking at number one. North Carolina native Calvin Richardson is a gritty, gospel-minded urban contemporary/neo-soul vocalist and songwriter whose influences have ranged from Sam Cooke, Bobby Womack, Donny Hathaway and Marvin Gaye to Jodeci and K-Ci & JoJo. He has released seven studio albums to date, including his latest, All or Nothing, in 2017. Ultimate soul crooner and Oakland native, Lenny Williams, possesses one of the most distinctive voices in contemporary music. With his rich, passionate vocal style, he is rightfully regarded as one of R&B’s most influential soul men. Williams began his musical career making records that have become R&B and Pop classics, including “Cause I Love You” (recorded on his solo album) and “So Very Hard To Go,” which he recorded as the lead singer of Tower of Power. Williams’ style has transcended into the new millennium, influencing many of today’s most popular R&B and hip hop artists.